Good looking green G M C ! 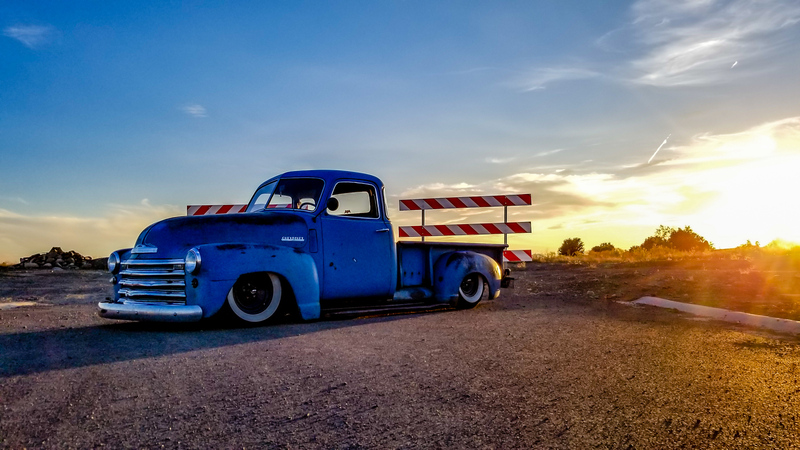 57 chevy truck, air ride, ls swapped. 52 chevy truck waiting its turn. Gigamanx, I think I have the same question. Getting ready to plumb my airbag system and would like to hear experiences with either hard or soft line too. DOT approved push-in fittings are kinda expensive and I hear a lot of guys complain about chasing down leaks. My plan is to plumb the airbags in -4 AN fittings (1/4" tube) with aluminum line. Stainless might be a better option, but it is difficult to flare without cracking and the fatigue resistance of the aluminum should be ok if it is fastened to the chassis correctly. To keep the cost of down for the AN fittings, I'm using steel JIC fittings, nuts and sleeves. I have a Parker Rolo-flair tool to make the flares in the aluminum and have had good luck making leak free connections with it. For the threaded connections, the plan is to use a anaerobic thread seal (Locktite 565) instead of teflon tape or pipe dope. Any other suggestions from guys with bagged trucks? there isn't much difference in either setup, more aesthetics rather than function. I had no problems with soft line and PTC fittings. I used blue monster tape on threads. I used 1/2 lines on my last bagged truck with accuair manifold. Current one Im using 3/8 with manual valves. I'm sure you may read plenty of debate out there, but I'm just giving my take with it. What's your ride height aired up? Last edited by Slowy-gonzalez; 01-07-2018 at 10:03 PM. I am using 3/8" lines Accuair valve. I ran rubber air line up front and have PTC nylon line out back. So far 10,000 mi all good. My truck is 5000lb. From the back...pls ignore all the parts in the back. Did you C notch your frame? If not do you have a picture of just the rear end bag set up on the frame? Thanks Great looking truck. Sorry I didn't mention that is was a Jag IRS - and there's no C notch. It was narrowed about 3" side to side and tube steel half shafts replace the Jag's forged half shafts. The ladder truss supports the differential and is mounted on urethane bushings. The bolt that hang the diff in the truss are about even with the bottom of the wood boards in a stock bed. The airbags ride on a trailing arm that connects to the Jag's LCA. It is a 5" Slam bag that does the same job as the Jag's coil-over springs. Oh, and here's a photo of the truck with the running boards on sitting on the bump stops. There's about three inches from the running boards to the concrete floor. The jag rear is well worth it, top notch job. When I was a kid in the 60's, a lot of the plastic model kits of hot rods had Jag rear ends - I'm sure there's better solutions out there, but it is all about the nostalgia and childhood memories. Thanks for the compliment, Mudman! Well you know many won't see it or even know what it is but...you do and I think of that on my own builds, it's about what we want and like right, but cool when others appreciate what we've built too. Keep at it, very nice build. Thank you for the pictures and explaination. Very nice work. Looking good man! You have done a great job on the build! At this point, I just want to drive it! No more 'enhancements'/science projects. Artillery style. Nice to see a bit of a spin on the ole smoothies. I LOVE the look on these.